Only 16 inches (405 mm) wide, the LK1600 can fit in almost any workstation area. It includes an alphanumeric keyboard with a full compliment of 55 function and numeric keys and an optional magnetic stripe reader. Furthermore, the unit also has a PS/2 I/O port to enable the daisy-chaining of other input devices such as a scanner or check reader. The LK1600 programmable keyboard is thus an ideal sol »Ver mas Only 16 inches (405 mm) wide, the LK1600 can fit in almost any workstation area. It includes an alphanumeric keyboard with a full compliment of 55 function and numeric keys and an optional magnetic stripe reader. Furthermore, the unit also has a PS/2 I/O port to enable the daisy-chaining of other input devices such as a scanner or check reader. 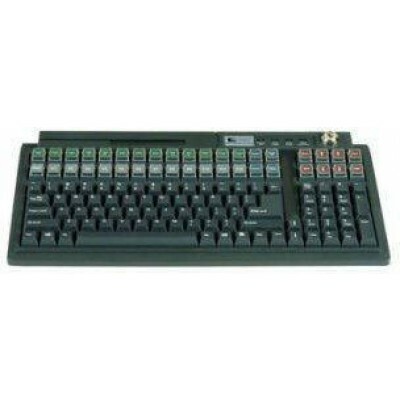 The LK1600 programmable keyboard is thus an ideal solution for the retail, hospitality, travel, banking, and insurance industries.